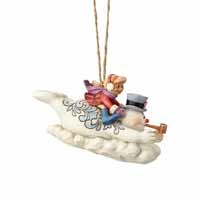 Frosty the Snowman and Karen Sledding | Jim Shore Ornaments Figurines | One Price Low Flat Shipping! 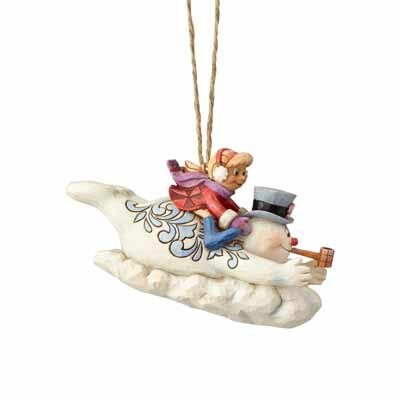 From the Jim Shore Heartwood Creek Holiday Collection, Frosty and Karen Sledding Ornament. Made of hand-painted stone resin. Measures 2.5" tall. Comes with hanging cord attached and packaged in collectible Enesco Jim Shore gift box. This fun piece features Frosty the Snowman with Karen on his back as they sled on Frosty's belly rushing down the hill to escape the evil magician! Our favorite snowman has his corncob pipe in his mouth and the famous magic hat on this head.